This vase block will be positioned in the Garden of Remembrance. The policy being that bereaved families may lease the block for a period of ten years, with an option to renewing the lease for further ten year periods. The black granite tablet with the inscription is purchased from the Crematorium and will be the property of the applicant. 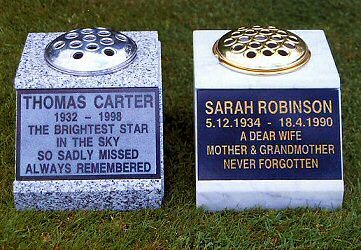 It is respectfully pointed out that cremated remains will still be buried loosely in the ground as per our policy. Also, a vase block will not be permitted above cremated remains. Families are requested to make an appointment with the office for the leasing of a vase block.